All Malcolm Clark had to do to find one was walk into the garage at Don Schumacher Racing (DSR) and ask. “Everyone has Sharpies here for signing autographs,” said Malcolm. This 31-year-old former Riley kid and Mitchell, Indiana native is the Executive Chef for the most winningest team in drag racing history. 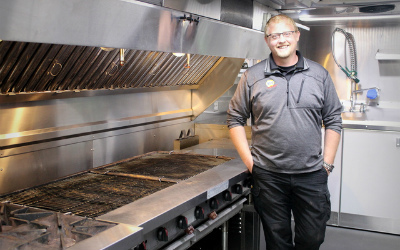 Trained at the Culinary Institute in Indianapolis, the team’s seven drivers, crew, staff and employees and sponsors are Malcolm’s customers every week. Also a point of interest is the fact that Malcom now works for a major sponsor of Riley Hospital for Children, the hospital that saved his life more than 31 years ago. Don Schumacher Racing, based in Brownsburg, Indiana, has raised over $624,000 for Riley Hospital through their annual open house and bowling event. In July 1987 when Malcolm was only 3 ½ months old, he landed in Riley with spinal meningitis for nearly five weeks. “He had a fever. But then he had a seizure while I was holding him. It just lasted a few seconds, but his entire little body started jerking,” said his mother Beverly. Martin Kleiman, M.D., was the infectious disease specialist who treated him at Riley. During most of his stay, Malcolm had an IV in his head, Styrofoam around his tiny port and was too delicate to go outside. “I really wanted to put him in a wagon and pull him around. I wanted to get him outside, but he wasn’t allowed to do that,” said Beverly. This was a serious infection which could have killed him, and Dr. Kleiman would not release him until all signs of bacteria in his body were gone. What 3 ½-month old Malcolm was not aware of during his hospital stay was that the national spotlight was on Dr. Kleiman, who, at the same time, was treating Ryan White. The young Kokomo, Ind. native became known around the world for bringing awareness to the AIDS epidemic. During the annual open house which benefits Riley Hospital, you’ll find Malcolm preparing food for the media room. He also prepares food for the VIP room at the bowling event every year in December. “DSR is more of a family, not a company,” says Malcolm. This year, he’ll be bowling with his own 5-year-old daughter, Mia. Click here to learn about, sponsor or bowl at the DSR Bowling Event on December 5. Also, visit RileyGivingTuesday.org and donate using the DSR4Riley Challenge Code to help Don Schumacher Racing in their fundraising efforts.